The giant panda lived for centuries in China's bamboo forests, and were regarded as semi-divine during the Han dynasty. They are now an endangered species. After the fall of the Shang dynasty in 1111 B.C.E., the succeeding dynasties of the Chou (1111-221 B.C.E.) and the Ch'in (221-206 B.C.E.) 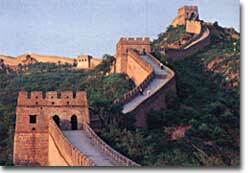 continued the great advances made by the early Chinese. Building techniques improved, and the use of iron became common. A system of hydraulics was used to dig riverbeds deeper, reducing the number of floods that destroyed farmland and endangered lives. However, during these dynasties there were also times of great disunity. Feudalism became popular during the Chou dynasty, a practice in which the king shared his power with lords, who in turn paid the king for their lands and titles. As the Chou dynasty weakened, lords fought among themselves. This Warring States period (403-221 B.C.E.) only ended when all of northern China was united under the Ch'in regime. 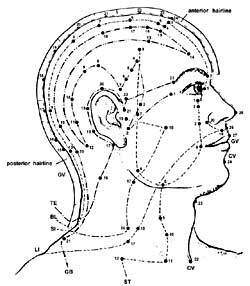 The ancient Chinese healing systems of acupuncture and acupressure use diagrams of points, called meridians, to direct energy flow throughout the body. Although the Ch'in created needed change in China's government, they were harsh leaders. They supported the idea of Legalism, which taught that human nature could not be trusted, and only with strict laws and severe penalties could society be successful. After only fifteen years, the Ch'in dynasty collapsed, replaced by Liu Pang of the Han. It was he who gained control over the border states, and established one of the most successful periods in Chinese history, the Han dynasty, in 202 B.C.E. The Han dynasty immediately restored feudal lords to their positions of power. The Chinese people prospered in peace once again. Paper and porcelain were invented during the Han dynasty, as was the wheelbarrow. Legend states that paper was first created in 105 C.E., but archaeological evidence suggests that it was in use up to 200 years earlier. In comparison, paper was not widely circulated in the West until 1150 C.E., over one thousand years later. Mike Dowling, "The Electronic Passport to the Silk Road." The 7,000-mile Silk Road flourished during the Han dynasty, allowing trade between China and India. The major achievements of the early Han dynasty revolve around the first emperor to reign under the Mandate of Heaven, Wu Ti. Emperors were under heaven's rule according to the mandate. Their success was based on the opinion of the gods. If the gods became unhappy with an emperor's rule, it was believed that signs would be sent to the Chinese people, usually in the form of natural disasters. In this event, the emperor lost the Heavenly Mandate, and was usually overthrown. The gods must have looked upon Wu Ti favorably, as he reigned for 54 years from 140-87 B.C.E, expanding the borders of China into Vietnam in the south and Korea in the north. However, it was his westward expansion that most influenced what became the Han Empire. Beijing: Glimpses of History published by Foreign Languages Press, Beijing, China. The Great Wall of China runs 4,600 miles, and is said to be the only man-made structure visible from space. Wu Ti had heard rumors of powerful and wealthy lands to the west. In 138 B.C.E. the emperor sent the explorer Chang Ch'ien with a party of 100 men to search the western frontier. Thirteen years later, Chang Ch'ien returned with only one of the original 100 men and told amazing stories of capture and imprisonment in central Asia. Although he did not succeed in reaching the lands of Persia, Arabia, or the Roman Empire, Chang Ch'ien did learn plenty about them. Wu Ti sent Chang Ch'ien to central Asia again a few years later, this time to make alliances using gifts of cattle, gold, and silk. Wu Ti's chief historian, Ssu-ma Ch'ien, later kept a record of these journeys and much more in his work called the Shiji (Records of the Historian). The Shiji chronicles the history of China from the Xia dynasty up to the reign of Wu Ti. 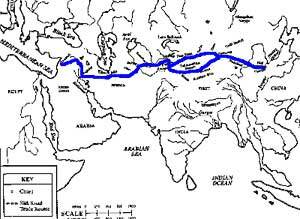 Chang Ch'ien's journeys began the widespread use of the trade route known as the Silk Road. Reaching as far west as the Caspian Sea, goods such as ivory, glass, wool, tapestries, exotic fruits and vegetables, precious metals and stones, even animals such as elephants and lions were imported into China. In return, foreign traders received furs, spices, jade, iron, ceramic, and bronze objects, as well as the much sought after silk. By the 1st century C.E., silk clothing became the style and obsession of Roman citizens. Arguably the greatest achievement in all of Chinese history continued during the Han dynasty — the construction of the Great Wall of China. Originally begun during the Ch'in dynasty, Wu Ti restored the wall, and continued it another 300 miles into the Gobi Desert to protect against attacks from central Asia. The Gobi Desert section was made with stamped earth and reinforced with willow reeds. Chinese artisans learned the secret of creating porcelain during the Han period. Europeans figured out the same secret ... in 1709. Yet the Great Wall has survived 2,000 years of invasion and erosion, spanning over 4,500 miles through northern China at the time of its completion. It is now regarded as one of the wonders of the world. The Great Wall came at a high price. At the height of its construction, one mile of wall was created each day, at an average cost of 10 lives per mile. Acupuncture, the piercing of needles into the skin, became popular in the 2nd century C.E. along with herbal medicine as a treatment for common illnesses. The Han also studied in astronomical matters. They believed comets, eclipses, and other unusual celestial events were ominous signs that could be used to predict future disasters. They created atlases depicting the shapes of 29 different types of comets as well as the accurate positions of Venus, Jupiter, and Saturn. Sunspots and exploding stars called nova were also first discovered during the Han dynasty. With only a short interruption by the reformer Wang Mang from 9-24 C.E., the Han dynasty lasted for well over 400 years. But by the beginning of the 3rd century C.E., the corruption in government that signaled the decline of nearly every Chinese dynasty had taken its toll. This corruption combined with political struggles and an increasing population, making a unified China impossible. The Han dynasty of China finally lost its Heavenly Mandate in 220 C.E., beginning nearly 400 years of political chaos. 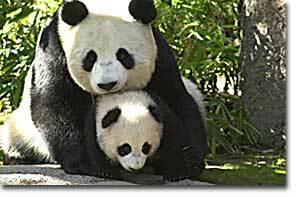 The giant panda was completely unknown outside of China until the end of the 19th century. Find out everything there is to know about these magnificent creatures that were regarded as semi-divine during the Han dynasty. Don't miss the panda news flash, famous pandas, and conservation efforts links. Precious metals were not the only things imported to China in return for the famous silk that India received. Buddhism spread from India to China through trade along the Silk Road. Learn more about the global impact of this 7,000-mile long trade route. This site has excellent images and is a wonderful introduction to the topic. Agriculture, engineering, and transportation are just a few of the fields profoundly influenced by Chinese discoveries and inventions through the centuries. For example, paper money was used as early as the 2nd century B.C.E. 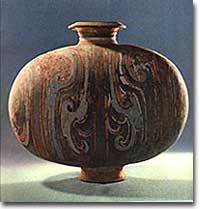 in China, while it did not circulate in Europe until the 1100s. Also, learn how Chinese mathematicians calculated the value for pi to nine decimal places when the mighty Greeks could do no better than four. The Western Han Dynasty was characterized by the shift of power from feudal lords and large land holdings to a central government powered by civil service workers. These employees were required to take examinations based on the classics of Chinese literature, insuring that only the most intelligent and devoted people were given jobs. 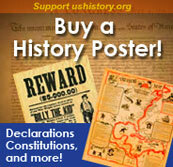 Click here for details on the beginnings of bureaucracy. To those accustomed to Western medicine, the practice of puncturing the skin with needles to stimulate energy flow throughout the body may seem just a bit odd. However, acupuncture has a recorded history in China spanning back at least 2,000 years, into the Han dynasty. Learn what exactly acupuncture is, and how doctors from both the East and West have integrated this ancient treatment into their practices.